June is here, and we couldn’t be more excited for summer! Where we’re located in Northbrook, IL, it is only 60 degrees today. Which is….a little anticlimactic, we admit. But we’re going to power through ’til the end of this week–when the weather will be in the mid-80’s!–by getting a head start on our 4th of July Crafts! It’s such a loud, wonderful holiday full of family time and celebrations that are literally explosive. To pass up on these 4th of July party ideas would be a huge mistake, especially when they are are so cute and inexpensive to make. 1. Old Glory Wall Hanging from Think Crafts! Looking for some kid-friendly 4th of July crafts? 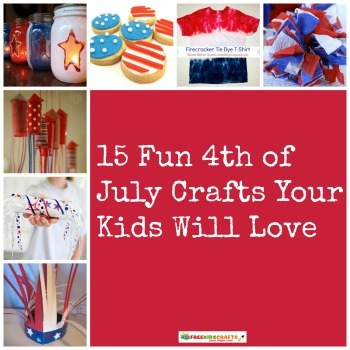 Check out, 15 Fun 4th of July Crafts Your Kids Will Love. Which 4th of July Crafts are you planning to celebrate with? One of the best things about the 4th of July is the time that you get to spend with your family celebrating Independence Day with 4th of July crafts, food, and fireworks. Every year my kids and I prepare for the 4th by putting together a list of fun patriotic activities that they want to do the most. Of course, my kids usually go straight for the 4th of July DIY accessories that they can wear to our annual red, white, and blue bash. 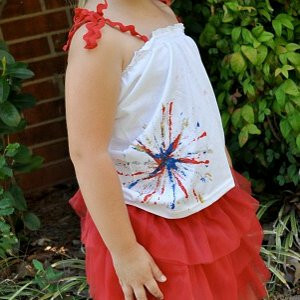 This year my daughter insists upon making the Patriotic Firecracker Tie Dye T-Shirt to wear to the party. Lately, she has been all about the tie dye shirt activities. It’s such an adorable shirt that it made the kids’ crafts list immediately. 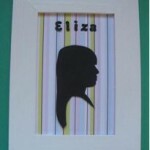 I love kids’ crafts like these because they are all so simple and inexpensive. My kids can do most of these crafts by themselves, which I find they enjoy even more because they like to make crafts and then surprise me when they’re finished. Make your 4th of July party a blast with these adorable accessories that your kids can make and wear to show their patriotism. Your kids can glam up their outfit with the Rockets’ Red Glare Bracelet, or they can add a burst of red, white, and blue to their attire with Firework Tops for the Fourth. You can add a blast of fun and color to your party desserts with these yummy 4th of July dessert recipes. These recipes are great to make with your kids because they’re so simple. My kids absolutely love it when we make the Fourth of July Fruit Flag Cake. They enjoy arranging the fruit on the cake to make it look like the American flag. One of the biggest parts of a 4th of July party is being outside, so why not let your kids create beautiful lighting with Fourth of July Luminaries? 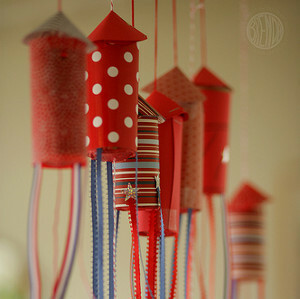 These gorgeous lanterns will give your outdoor party the spark that it needs, and your guests will enjoy the personal touch that your kids made to the party with their Fourth of July crafts. You can never have enough red, white, and blue fun with your kids. 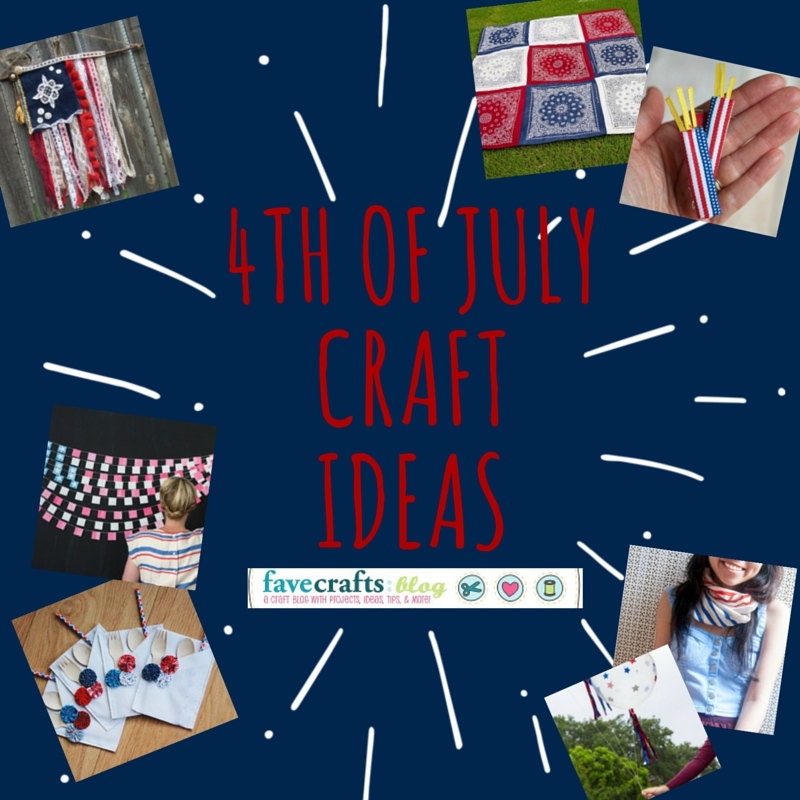 If you’re always looking for more 4th of July crafts for your kids like I am, then download your free copy of 21 American Craft Projects: Patriotic Crafts for Memorial Day, Veterans Day, and 4th of July Crafts for Kids free eBook. There are tons of adorable Fourth of July crafts that your kids will love! 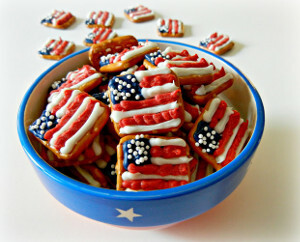 How are you celebrating the 4th with your little ones? We celebrate our national pride on several occasions, and it can be tricky to come up with crafts all year round that will complement your decor. 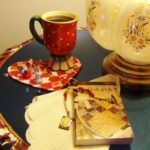 Luckily, the editors at AllFreeHolidayCrafts.com are always searching for new ideas for all of you readers, and we’ve found some truly outstanding patriotic crafts that will inspire your patriotism this holiday season. Burlap Stars and Stripes Bunting – If you plan on throwing a party, you’re going to need a patriotic decoration that your guests will notice as soon as they reach your home. This rustic bunting uses a classic design to show off your spirit, and the materials are durable and easy to work with. While some hanging decorations require more advanced skills, this bunting is for crafters of all levels. The result is a charming way to welcome your guests to your next patriotic event. Patriotic Decorative Blocks – Another unique decorative idea from our patriotic crafts page shows you how to turn old wooden blocks into festive decorations for any room in your house. If you’re looking to try your hand at decoupage, this is the craft for you. The design looks twice as difficult to make as it actually is, and the sturdy design ensures repeated use during all of your patriotic celebrations. Patriotic Flower Centerpieces – For a creative way to make your table stand out, check out the full tutorial for a unique centerpiece. Working with real flowers can be a hassle, and they only last for a certain period of time. This project is the perfect alternative, as it uses fabric flowers and recyclables, so you can keep your centerpieces for as long as you like. 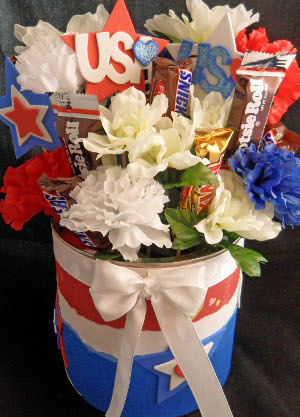 By adding your favorite candies as the finishing touch, you’ll have designed a patriotic craft that will be the center of attention on your holiday table. Finger Painted Flag – Any good patriotic celebration has an easy craft to entertain the kids. Finger painting is a fun way for them to get dirty, but also create something that they can be proud of. Inspire the spirit of the holidays by showing the children at your party how they can make their very own American flag. This patriotic project will definitely keep them busy so everyone can relax and enjoy their holiday. Delicious Patriotic Cake Balls – Top off your patriotic holiday festivities with a dessert that’s both delectable and decorative. These little snacks provide small portions for guests who aren’t looking to fill up on pastries, and the size allows you to create more pieces with the same amount of mix as a regular cake. Choose your favorite flavor and get ready to light the fireworks on your guests’ taste buds! 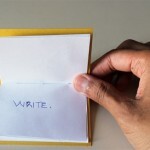 Here at AllFreeHolidayCrafts.com, we’re always looking for ways to help you make the most of your celebrations. If you’d like to see more patriotic crafts like these, be sure to head over to our page. Which patriotic holiday is your favorite? We want to hear from you, so let us known below! 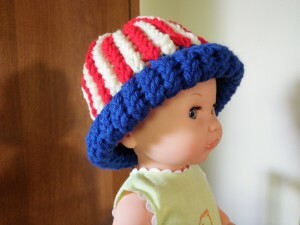 Download the New Free July 4th Crafts eBook from AllFreeHolidayCrafts! 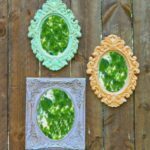 I’m someone who loves to craft all throughout the year, which means that by the time summer comes around, I’ve got more leftover materials than I have ideas in my head! With July 4th coming up, I’m sure many of you are also wondering how you can make patriotic decorations that will sparkle and pop at your parties with the craft items you already have at home. 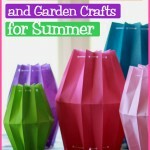 You’re in luck, because the editors at AllFreeHolidayCrafts.com have been hard at work creating a free eBook filled with colorful and creative 4th of July crafts. When you look inside the pages of How to Make July 4th Decorations: 8 Patriotic Craft Tutorials eBook, you’ll find easy instructions and ideas to inspire your homemade 4th of July decoration crafts. 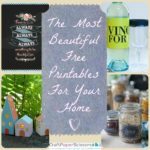 There are crafts for people of all ages, so everyone in your home can be included in the festivities. I’d like to give you a sneak peek with one of my personal favorites. These Fourth of July Luminaries show just how versatile this eBook encourages your crafting to be. 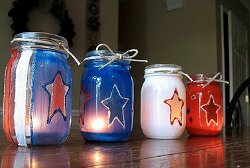 With objects like jars and paint that you can find in your own home, you can make a beautiful recycled 4th of July craft like this that can be used as a patriotic outdoor decoration or a 4th of July table decoration. You don’t want to be the only one having fun with your holiday crafts. The How to Make July 4th Decorations: 8 Patriotic Craft Tutorials eBook also includes 4th of July crafts for kids that are always safe and easy. 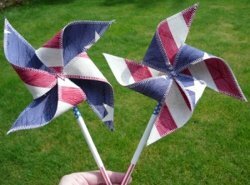 The Patriotic Pinwheel, for example, is a fabric craft that you can do along with them, and that they can show off proudly to everyone as something they helped to make. These crafts also work as free easy summer crafts; if you find your kids enjoying these patriotic crafts, be sure to bring them back once school’s out. After downloading this new free eBook from AllFreeHolidayCrafts.com, you’ll be ready to bring a patriotic twist to your next Fourth of July party. These fifteen 4th of July crafts will provide you with everything you need to decorate and celebrate the summer holidays. Download your free copy of How to Make July 4th Decorations: 8 Patriotic Craft Tutorials now! We’re interested to hear from you; What’s your favorite 4th of July memory? Let us know below. Michael Sellick shows you how to create an American Flag Hat for Babies. You can use the same techniques to change the colors to what you feel like. Today’s tutorial is about completely newborn baby hats on your round loom knitting rings. We push limits a bit further and show you how to create vertical stripes on your round loom to create an interesting effects. 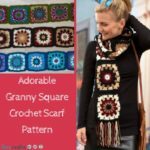 I find many women who are completing this pattern have friends or love ones in the military. They give these as gifts to show their patriotic support to the United States. I created three different types of hats using stripes. This is hat 1 of 3. 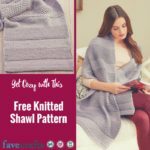 You can find more free loom knitting patterns at AllFreeKnitting.com. It’s a GRAND Old Flag! How I miss all things America living abroad! I’m really looking forward to my trip back home to Indiana in a week. Getting me in the patriotic spirit for 4th of July, Becca Rowberry of Nap Time Journal sent over this awesome 4th of July craft project for making your very own American flag with foam, fabric and ribbon. No sewing is required! Woohoo! Go check out the Grand Old Flag Project! This Monday is Memorial Day, a national holiday where we recognize and remember those men and women that have died in military service for our country. While many of you have BBQs and other activities planned, why not create some patriotic Memorial Day crafts to show your pride and support for America? They are a great way to decorate for the occasion and will demonstrate your respect for the ultimate sacrifice these soldiers made. On our Memorial Day page, you’ll find 8 Memorial Day crafts including 3 projects for kids. In addition, you’ll learn a little history of the holiday and some interesting trivia to impress family and friends. Did you know that the first Memorial Day was created by freed slaves to honor Union Solders? Read the entire inspiring story! Don’t forget to observe the National Moment of Rememberance at 3pm on Monday with a moment of silence. I’ve always been fascinated by safety pin pins! After the tragedy of 9-11, my friend Nancee and I made hundreds of these pins with an American Flag design. We sent these pins to NYC and the Pentagon as a way of expressing our concern and care for the survivors of the overwhelming tragedy. Making the flag pins was calming and help ease our worries and fears. There is something relaxing about sliding the beads onto the safety pins, and then sliding the beaded safety pins onto a final safety pin and the American flag emerges. Flags are just one of the designs that can be done with safety pins. All kinds of motifs are used including hearts, animals, flowers, and symbols. Here are some sites that have the patterns and instructions for making safety pin pins. In honor of Obama’s inspiring inauguration this week, we have put together a round-up of our favorite patriotic crafts. For those of us living in Chicago, the new President is all the more special. When Obama spoke at my graduation convocation at Northwestern several years back, when the campus was more excited than when Kanye came, I never dreamed he would be President in just a few years. Here are our favorite crafts to celebrate our great nation, for which so many people feel reinvigorated pride. Right now nothing is more patriotic than President Obama. Cupcakes are pretty high on the list as well. This presidential portraitwas made using 1240 cupcakes. Nothing screams patriotism like wearing an old U.S. coin as a wedding band. 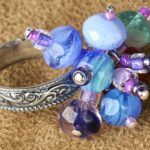 This is actually a pretty cool idea and this post at Crafting a Green World links to detailed instructions on how to make the rings. Not bad for $3. I’m sure by now most people have seen the Obama Craft Project but I went back through to look at some of the cool crafts featured. They are so amazing! 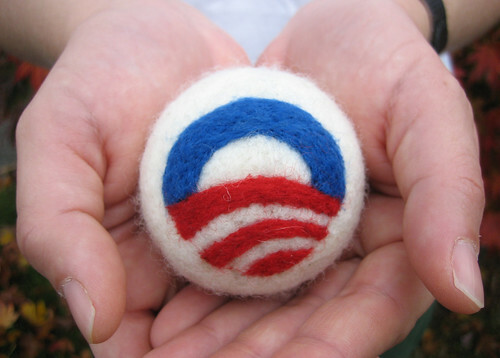 One that stood out to me was this super cute needle felted Obama logofrom flickr user feltcafe. Crafting for change? Yes we can! I love these knitted star and stripes felted hot padsby Whitney at The Purl Bee — festive and great for keeping your hands burn free and your kitchen patriotic. 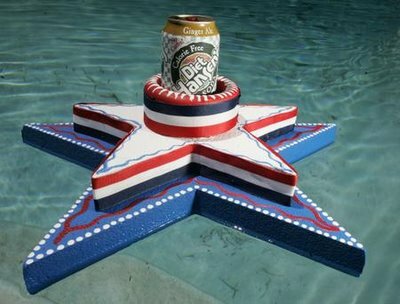 Maybe these crafts aren’t suitable for cold winters like Chicago but I’m sure some places are still enjoying the sun right now so I’m loving the Star Spangled Pool float and Coke Can Star Lightsfrom Kathy at Crafty Chica. I love the vintage charm of these Patriotic Poster Drink Charms, via Instructables. 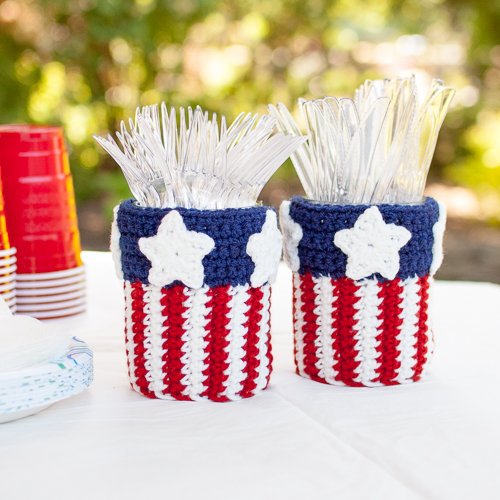 Mixed with red, white and blue beads, these certainly give an interesting touch to glasses at a patriotic party. If you happened to have missed this, go over to Obamicon and turn any picture into one inspired by Shepard Fairey’s iconic poster of Obama.